Clay Walker is about to release a new record this summer. The album will be called "Long Live Cowboy" and the singer promises it would be pure traditional country music. Yee Haw! Chris Young revealed his guests on the upcoming record, which will feature duets with Vince Gill and 2013's The Voice winner Cassadee Pope. Chris also co-produces the new album, which should come out later this year. Merle Haggard and Willie Nelson are teaming up once again and on June 2 they will release a new album called "Django And Jimmie". They already released a music video for the first single "It's All Going To Pot". Now that's bro-country! Popular duo Montgomery Gentry is going to release a new album on June 9. 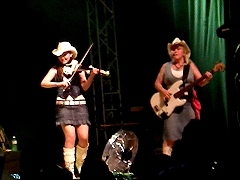 The record is named "Folks Like Us" and the title song is a current single. Willie Nelson finally wrote his own memoir. Look for a book named "It’s a Long Story: My Life". Wade Hayes: Always Move Forward! 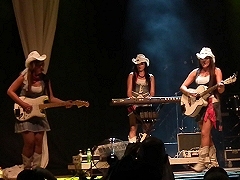 During the 40-year existence of the Country Sisters there has been more than 50 girls playing the band! Today you'll learn what it takes to play in the Country Sisters band and how the girls are in touch with past band members. Have you ever had real sisters in the band? Sonia: "We have. Around '98 there were two sisters and then we had twins in the band in 2000. So sisters once and then twins once. I think we might have sisters in the band again in the future, because Maggie's younger sister is very talented and she wants to play with us when she gets older. So maybe there will be sisters again." Sonia: "The issue of future band members is solved for a long time... But what if you asked 'how do you keep in touch with past members?'" How do you keep in touch with past members? Sonia: "Great that you're asking!" (laughs) "Contacts with former band members are mostly very good. 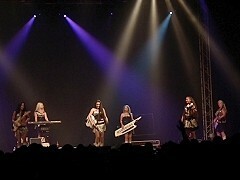 Several girls play in another band, makng music..."
Claire: "And some of them are really great, we've seen them several times." Alena: "I keep in touch with Lucy all time, becase we are very close friends. I also see Linda a lot and recently I met with Andrea Cejpkova, who just got back from Africa." Andrea: "I suggest a question about how the Country Sisters form a new band member, that's also very interesting..."
Sonia: "How do you manage to turn a girl into a Country Sisters?" Andrea: "Then I started to paint my nails...."
Sonia: "Then she changes the color of her hair, starts using make-up for the first time..."
Andrea: "Yes, I started to use a lot of make-up and actually bought make-up for the first time in my life..."
Sonia: "She starts wearing high heels." Andrea: "I quit drinking a little..."
In the next part we'll talk costumes: How many of them do the Country Sisters have and what influences the choice of costumes for a show? Find out tomorrow! (C) Petr Mecir 2012. All rights reserved. Interview with Klara Tibitanzlova: I'm Just An Exhibicionist!